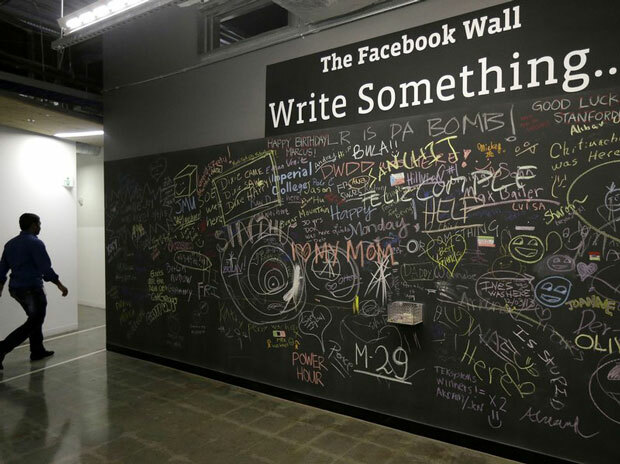 Employees and visitors can leave messages on walls like this on the Facebook campus in Menlo Park, Calif.
Facebook CEO Mark Zuckerberg is scolding employees for what he calls "several recent instances" of people crossing out "black lives matter" on signature walls at the company&apos;s headquarters and writing "all lives matter" instead. In a note posted to employees on a company announcement page, published by Gizmodo, Zuckerberg says he and several other leaders at the company have previously warned employees against doing this. "I was already very disappointed by this disrespectful behavior before, but after my communication, I now consider this malicious as well," Zuckerberg writes.
" &apos;Black lives matter&apos; doesn&apos;t mean other lives don&apos;t. It&apos;s simply asking that the black community also achieves the justice they deserve. "We&apos;ve never had rules around what people can write on our walls — we expect everybody to treat each other with respect. Regardless of the content or location, crossing out something means silencing speech, or that one person&apos;s speech is more important than another&apos;s."
The phrase "black lives matter" actually traces its origin to a conversation onFacebook. It came in reaction to the acquittal of George Zimmerman in the fatal shooting of 17-year-old Trayvon Martin. Since then, the phrase has come to signify theracial justice movement that has grown in response to a series of police shootings of unarmed black men. "For those at the heart of the Black Lives Matter movement, these words hit the wrong note. &apos;All lives matter&apos; is a phrase adopted by those who seek to minimize or criticize the movement." Zuckerberg&apos;s note says that the company is investigating the incidents, because they have been "deeply hurtful and tiresome" for the Facebook community. Facebook has confirmed the authenticity of the internal note to NPR but has not provided further details of the investigation. Of course, it&apos;s important to point out that Facebook — like much of Silicon Valley — has been struggling to diversify its work force and remains a company that&apos;s heavily white and male. Here&apos;s a chart NPR built earlier this month when Intel, in unlike other tech companies including Facebook, released a highly detailed report on its progress and goals in hiring women and underrepresented minorities. Like others, Facebook has been working to improve the ratio and, according to Zuckerberg&apos;s memo, plans to hold a town hall next week where staff can "educate themselves about what the Black Lives Matter movement is about." "Companies like Facebook pull talent from top schools, many of which are also verywhite. Then, employees refer people who look like them.
" &apos;If you want to change the ratio, stop referrals,&apos; Miley told HuffPost."